Last week, DNC member Jon Ausman filed a petition with the party's rules and bylaws committee pointing out that the charter of the DNC uses the verb "shall" when describing the relationship between superdelegates and the convention, as in -- superdelegates "shall" be seated. The argument, basically, is that the charter supercedes any penalty imposed by the RBC. The counterarguement is that the verb "shall" is later qualified. The 28 members of the DNC's Rules and Bylaws committee may well decide that the challenge has validity and may well decide to seat the superdelegates from Florida, and then, should there be a similar petition from Michigan, the superdelegates from Michigan. What's Next for Florida in Primary Fight? The issue of what will happen with Florida's Democratic primary voters has not been settled by the decision not to hold a new election. Attempts are still underway to have Florida delegates seated in accord with the Jan. 29 primary results. On the Fox News Channel, Gov. Crist once again calls for the party to “do the right thing” and seat the delegation as-is in Denver — voted in by a record-breaking turnout. That's the right solution. Also, on CNN an hour or so ago, before the spin doctors came on, a reporter who had spoken with Florida Democratic Party Chair and Congresswoman Karen Thurman said she told him that all options had not been exhausted -- or even explored yet-- and that efforts were ongoing to find a solution acceptable to both campaigns. The Florida Democratic Party has rejected a plan for a new primary. In an e-mail sent to Florida Democrats late Monday afternoon, state party Chairwoman Karen Thurman said, "We researched every potential alternative process -- from caucuses to county conventions to mail-in elections -- but no plan could come anywhere close to being viable in Florida." Thurman said the decision now falls to the DNC Rules & Bylaws Committee, which is scheduled to meet again next month. Thurman says the consenus of the thousands of e-mails was that Floridians don't want to vote again. Of course they don't. More than 1.7 million Democrats already voted and they chose Hillary. They want their vote to count. And it should. The DNC is the culprit here. They need to retract the penalty and award and seat the delegates in accordance with the January 29 vote. 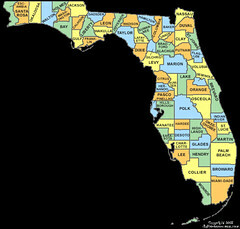 Update: A must-read primer on the Florida primary battle by Mary Beth at Wampum. Update: Comments now closed, new Florida thread here. Thoughts? Mine are we don't need a revote. The DNC needs to lift its penalty against Florida, award the delegates and seat them in accordance with the Jan. 29 vote. Floridians voted in record numbers, the parties were all on the ballot, everyone got to see and hear both candidates in televised debates and in the news. The Republican-dominated legislature forced the early date. The DNC needs to admit it was wrong in assessing the penalty and lift it. If they don't, I'm concerned that Floridians will blame the Democratic party and sit out the November election. Let's not hand the election to McCain. Let's skip the revote plan and award and seat the delegates according to the Jan. 29 record breaking primary vote. Update: How Florida voted on Jan 29 is below the fold. Obama did dismally. It's obvious why he doesn't favor a recount. Judging from the comments the Obama supporters are leaving on TalkLeft, it appears there's a fundamental misunderstanding on what the candidates promised and didn't promise regarding the outcomes of the Florida and Michigan primaries. Here's the four state pledge (pdf). It says nothing about which delegates will count or not count in Florida and Michigan. It says nothing about whether a state's primary will count or not. The candidates merely pledged not to campaign in any states holding a primary or caucus before Super Tuesday, other than Iowa, Nevada, New Hampshire and South Carolina. What's Obama's Saying About Mail-In Revotes in Fl. and MI? Can anyone tell what Barack Obama will agree to and won't agree to in terms of a Michigan and Florida re-vote? Here's the latest. The comments on Big Tent Democrat's earlier post are full, this is a new thread on it. The AP reports a consensus is being reached about a mail-in do-over vote in Florida and Michigan. Where is Obama on this? Will he agree? Were Michigan voters really excluded? Here's the map of how Michigan voted. It looks like about 675,000 Dems voted. In 2004, about 150,000 Dems voted in the MI primary. It was widely circulated in Michigan that Obama and Edwards supporters should vote uncommitted. Clearly, Detroit and Washtenaw County got the message (see the map.) So did Emmet county, which by the way, went 60% to Bush in the general election. It's not clear who Emmet s votes were for. Hillary's supporters came out. How much support does Obama have in MI outside of Detroit and Washtenaw county? Both candidates have to agree to any new plan. If Obama withholds consent, does he raise the chances the delegates from the first votes will get seated in time to count? "Although there have been a lot of conversations about how to assure that our delegation is seated, the logistics and cost of any firehouse primary may simply be insurmountable," said Liz Boyd, Granholm's press secretary. ...Granholm's comment instantly deflated hopes in Michigan of finding a solution, barely a day after expressions of optimism. "That took the oxygen out of the room," said one Democrat in the middle of the discussions, who talked about the deliberations on the condition of anonymity. "I'm regrouping." Update: A Michigan state legislator was just on CNN. He said there are no concrete plans for a do-over be it a primary or a caucus. While there have been discussions, nothing has been decided. He is an Obama supporter. He's telling everyone to slow down, a do-over decision (or whether it would be a primary or caucus) is not certain. He also acknowledged that he supported the early primary and the reason for it was to be more relevant. He said they made their bed, they will lie in it. Contrast this to Florida where the primary was moved up because the Republican dominated legislature forced the early date on them. Big Tent Democrat has another update below the fold. 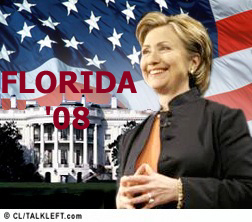 Despite Big Tent Democrat's five posts on Florida here today, not all has been said. Now the Clinton campaign has begun expressing openness to a do-over. "Let's let all of the voters go again if they are willing to do it," said Clinton adviser Terry McAuliffe Tuesday night on MSNBC. "Whatever we have to do to get people in the system, let's do it." "We're going to abide by their rules as they exist now and whatever happens in the future," Obama campaign manager David Plouffe told reporters Wednesday. "I don't think it's for our campaign or her campaign — we're in a heated contest here — to have to be the facilitators here," Plouffe said. "This is between the DNC and those state parties." It makes sense Obama would be only luke-warm to the idea. Just look at the results from the Florida primary, a scant 5 weeks ago. He won only the northern counties closest to Georgia and the deep south. He won no county below the top of the state. Update 8:00 pm : CNN calls Florida for Hillary Clinton, based on exit polls and 15% of vote in. CNN says more people voted in Florida than all the other states combined. CNN says the Obama campaign's response is Florida is a tie: 0 delegates for Hillary, 0 for Obama. I guess that means he won't call to congratulate here. Update 7:45 pm: Hillary still way ahead in the counties reporting so far. Obama ahead in one county, Leon -- located at the top of the state. Demograpics for Leon County here.